Goodreads says, "Recently divorced, Merilee Talbot Dunlap moves with her two children to the Atlanta suburb of Sweet Apple, Georgia. It's not her first time starting over, but her efforts at a new beginning aren't helped by an anonymous local blog that dishes about the scandalous events that caused her marriage to fail. Merilee finds some measure of peace in the cottage she is renting from town matriarch Sugar Prescott. Though stubborn and irascible, Sugar sees something of herself in Merilee--something that allows her to open up about her own colorful past. Sugar's stories give Merilee a different perspective on the town and its wealthy school moms in their tennis whites and shiny SUVs, and even on her new friendship with Heather Blackford. Merilee is charmed by the glamorous young mother's seemingly perfect life and finds herself drawn into Heather's world. In a town like Sweet Apple, where sins and secrets are as likely to be found behind the walls of gated mansions as in the dark woods surrounding Merilee's house, appearance is everything. But just how dangerous that deception can be will shock all three women...."
Merilee, mother to Lily and Colin, leaves her cushy life behind after her divorce and moves into a cottage on a farm in Georgia. Sweet Apple, Georgia is the quintessential Southern town and of course everyone knows everyone's business. She is renting a charming cottage on Sugar Prescott's farm, an older woman who has a no nonsense reputation around town. Merilee's children are starting over at a private school, but things are a bit different than she expected. The other moms are very high maintenance and are helicopter parents. Think Desperate Housewives meets Gone with the Wind. While trying to figure out her place in all of this, Merilee meets another mother, Heather, who takes her under her wing. Heather is pretty much the Queen Bee of Sweet Apple and they surprisingly hit it off. Thanks to Heather, Merilee finds her niche in the community, volunteers for a committee at school, and meets a whole new world of people. This is all juxtaposed by Sugar and her way of life, which is entirely different than Heather's. Sugar grew up when things were different in the South and is the polar opposite of Heather. Sugar is all about farming, home cooked meals, no technology, and other remnants of days gone by in Georgia. Although Sugar doesn't take to many people, she cares about Merilee since she is a single mom just trying to get by. Readers get to know a bit more about Sugar as we flashback to her memories of growing up on the farm and the various people that lived in Sweet Apple in the past. But as things progress for Merilee, she comes to find that behind the perfect people that live in Sweet Apple are secrets and things aren't what they seem. Perhaps things aren't so perfect after all, especially if you dig a little deeper and look closely. Karen White's The Night the Lights Went Out is a fantastic novel. It has everything that I want in a read. There's a Southern setting, some romance, some flashbacks to the past, compelling charcacters, and an edge of your seat mystery. I adored Merilee from the beginning of The Night the Lights Went Out. Although she was pretty naive at times and too trusting of some of the women, I still felt for her situation. Her divorce wasn't easy; in fact, it was downright scandalous, so starting over and leaving all that behind is tough for her. She also has an interesting past and is dealing with her own issues, especially when it comes to the untimely death of her brother. When Heather takes Merilee under her wing, she relies on her much more than she should due to the place that she is at in her life. She also takes to Sugar, who she has a strong connection with. Even though Sugar is ninety some years old, she finds they have more in common than she thought. Which leads me to the character of Sugar....I loved, loved, loved her in The Night the Lights Went Out. White did such a great job bringing her to life and I adored the flashbacks to her life on the farm many years ago. Her life was also filled with scandal, secrets, and many ups and downs. I thought White did a good job alternating the present with Sugar's past. It was very compelling! There's a mystery in The Night the Lights Went Out, which also kept me on the edge of my seat. I didn't see it coming, but I was able to figure out who not to trust. Of course it takes some time for Merilee to figure out who is sincere and who is playing her, but that was part of the fun. White also incorporates a few chapters that are excerpts for the town blogger who shares some juicy gossip and words of Southern wisdom. I absolutely loved this and I thought it as a nice touch. 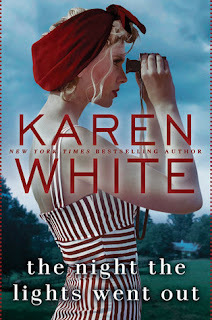 So if you are looking for an atmospheric tale that has it all and will keep you on the edge of your seat, but also has some humor, history, and romance give Karen White's The Night the Lights Went Out a try this spring. It reminded me of a southern Big Little Lies and it's definitely one of my favorite books of the year. If you aren't sold yet, check out the excerpt of The Night the Lights Went Out below. And thanks to Berkely, I am hosting a giveaway for Karen White's Flight Patterns, which just came out in paperback last month and is perfect for your beach bag this summer. 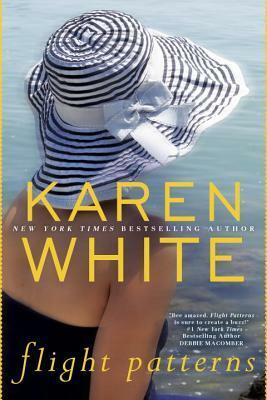 It seems like another great beach read and I plan on reading it as well as I am now a huge fan of Karen White. "FLIGHT PATTERNS tells the story of Georgia Chambers, a fine china expert who left her family years before and is forced to return home and repair the relationships she’s carefully avoided. To embrace her own life—mistakes and all—she will have to find the courage to confront the ghosts of her past and the secrets she was forced to keep." The giveaway is open to US readers and the deadline is April 23, 2017. Please refer to my giveaway rules. Good luck! "A cluster of moms stood in the parking lot surrounded by high-end SUVs following first day drop-off at Windwood Academy. The women appeared to be listening with rapt attention to the tall blond woman in the center of their semi-circle, her hair arranged perfectly beneath her white tennis visor, her long and lean limbs brown and glowy. Merilee noticed this last part only because her ex-mother-in-law had given her a bottle of glowy lotion for her last birthday and Lily had told her it made her look sparkly like Katy Perry in one of her videos. Merilee had thrown out the remainder of the bottle, realizing she wasn’t the type anymore to look glowy much less sparkly. But the blonde definitely was. Her whole body glowed. Her face glowed. Even the hair visible beneath the visor appeared to be lit from within. The woman looked vaguely familiar, and Merilee realized she’d probably been one of the mothers she’d met at the open house the previous week. She’d only been to the one let’s-get-acquainted event, her work schedule precluding any of the various parties that were held almost exclusively on weekdays when she worked. Merilee was terrible with names, had been ever since she started dating Michael. He was so good at it, always reminding her who everyone was when they were at a party, that she’d simply stopped trying. She hoped she was only out of practice instead of permanently disabled. Her children’s futures probably depended on it since Michael wouldn’t be there to make sure Merilee remembered the names of Lily’s friends who were or were not speaking to each other. And which of Colin’s teachers appreciated his dreamy attitude and those who didn’t. It had always been a game with them—her recalling every detail about a friend or teacher, details always overlooked by Michael—and then he’d fill in the missing part—the name. But now she had to do it all on her own. She smiled vaguely in the direction of the blond woman and her entourage and had almost made it to her van when she heard her name being called. Merilee remembered the voice. It was very Southern, heavily laced with dropped consonants and elongated vowels. The most memorable part about it was that it sounded exactly like Merilee’s mother. “Only four…” Merilee took the list and looked at it, almost letting out an audible sigh when she saw the woman’s name at the top of the page, Heather Blackford, Class Mother, followed by three different phone numbers. Now she remembered. Heather had a daughter in Colin’s class, too, both girls’ names starting with ‘B’. The ladies behind her all nodded in understanding. “Yes, well, I’ll take a look at it and get it back to you tomorrow.” Merilee was already wondering how she was going to approach her boss to ask him for more time off. The divorce and move had already eaten up all of her vacation time, and although Max was kind and understanding, everyone had their limits. “Oh…” Merilee simply blinked her eyes for a moment, wondering if Heather had meant to be insulting. “Wonderful.” Heather beamed. She pointed a key fob toward a black Porsche SUV with vanity plates that read YERSERV, and the rear door slowly raised. As the other mothers oohed and ahhed appropriately, Merilee stared into the trunk where fourteen metallic gift bags with blue or pink tissue paper expertly pleated at the tops were arranged in neat rows. “You are just too much,” one of the mothers said as the other women eagerly stepped toward the car and took a bag." Oh, that's so weird. I was under the impression that this book was set in the 20s. Must be the cover! I love Big Little Lies so this book is definitely worth checking out. It does have a very retro cover and there are flashbacks to the past, but it also takes place in the present as well. I think you'd like this one, Joy. Thanks for visiting!